Construction hoarding signs that contribute to a greater understanding of the work undertaken by United Utilities in the communities they serve. 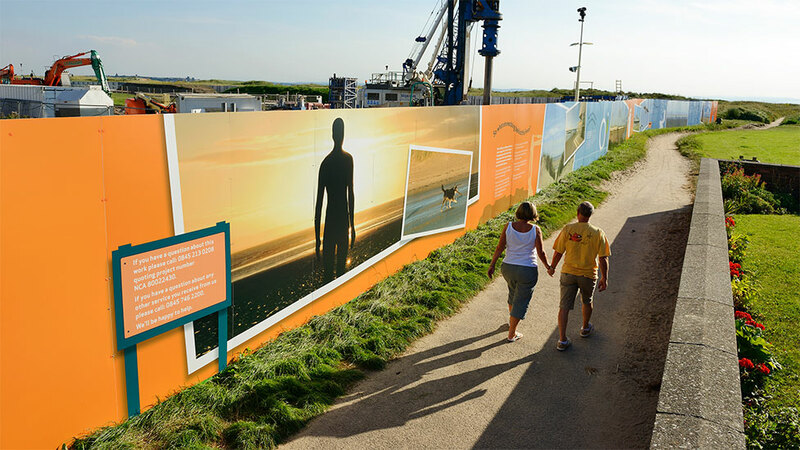 After the success of a number of similar projects across Cumbria and Lancashire, United Utilities asked us to produce another series of construction hoarding signs to be used near Crosby Beach on Merseyside, where the infrastructure management company were carrying out essential groundwork to combat flooding in the surrounding areas. The extensive improvement scheme is located just off the popular and well visited beach, famous for its cast iron statues by Anthony Gormley. Our client was keen to communicate the positive impact of the works in an engaging, uplifting and enlightening graphic style that would blend in with the surrounding environment. As the site compound was to be surrounded by solid hoarding as a safety requirement, it offered the perfect space to speak to the general public, local residents and tourists alike. The communications team wanted to tell passers-by what they were doing in Crosby and why. They also needed to provide an overview of United Utilities as a business, and ensure their positive investment in the local infrastructure and environment was portrayed. In addition, the construction hoarding signs offered a fantastic opportunity to promote awareness of the company’s recently refreshed branding. 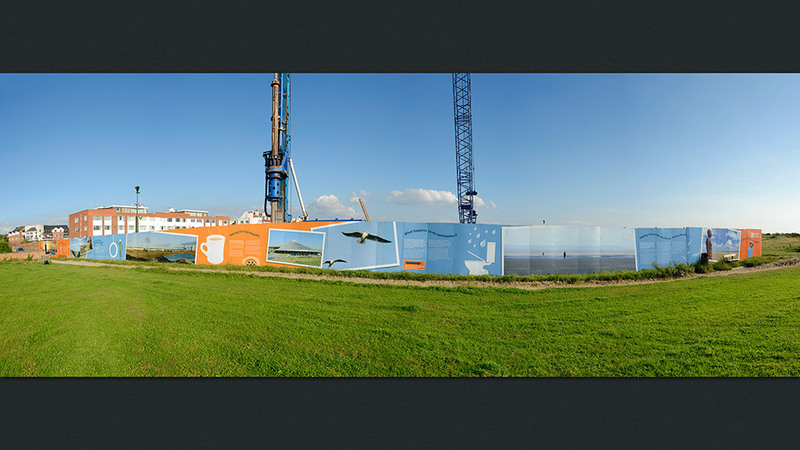 Bespoke photography of local landmarks and activities were commissioned and used to great effect within the design. Accompanying these were vector-based United Utilities branded graphic icons and illustrations, which when married to the unique brand colour scheme, gave the whole piece a very positive, friendly tone. 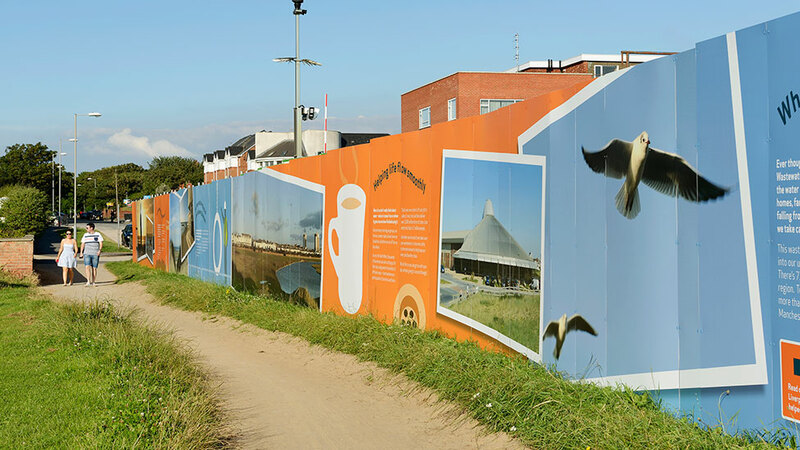 The construction hoarding signs were manufactured using metal dibond panels, and attached to the site hoarding with extra long rivets in order to withstand the punishing weather on the North West coast. From concept to installation the entire construction hoarding signs project took just an incredible four weeks, a very quick turnaround for such a large-scale scheme. We were involved throughout the process, including speculative site visits to establish the size and ground variations, right through to manufacture and installation. According to feedback the construction hoarding signs have been really well received by locals and tourists who now have a greater understanding of the work undertaken by United Utilities, and a more positive view of the improvement scheme as a whole.